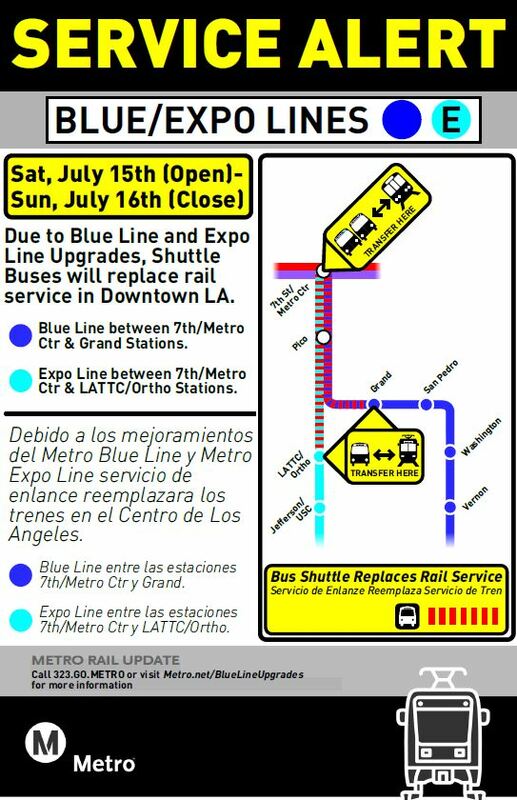 This Saturday, July 15 and Sunday, July 16 from open to close of service, bus shuttles replace the Blue Line between Grand/LATTC and 7th St/Metro Center and the Expo Line between LATTC/Ortho Institute and 7th St/Metro Center as crews perform preventative maintenance and upgrade the segment’s overhead power supply system. For Blue Line riders this means southbound service will start at Grand/LATTC Station. Those traveling between Grand/LATTC and downtown L.A. will need to board free shuttles to continue their trip. Bus shuttles will be available for Expo Line riders traveling between LATTC/Ortho Institute and downtown L.A., and westbound service will begin at LATTC/Ortho Institute Station. Both lines are slated to run every 12 minutes while the work is in effect and shuttles will match service levels as best as possible. Please note trains will not follow the regular posted timetables. Finally, thank you all for your patience as we work to enhance the Blue and Expo Line. Regular train service in downtown L.A. will resume Monday, July 17. If you’re traveling through the area this weekend, be sure to follow us on Twitter @metrolosangeles or metroLAalerts for real-time service updates. Agreed. Tunnel should’ve been done on day 1. Even though elevate is cheaper, I don’t know if the neighbors will allow an elevated train in this area, although it’d be nice.